The animation editor lets you view and edit animated parameters and how Houdini fills in the transitions between keyframes. You can use the graph editor view (shows changes in parameter values over time as a graph), the parameter table view (shows parameter values at each keyframe in a table), or the dopesheet view to edit animation. To switch between these views, use the pop-up menu at the top left of the pane. You can click on a channel group in the animation editor and choose Motion Effects > Create Clip to create a single Channel CHOP, moving all the channels in that group to it. Alternatively, if you have multiple channels in the channel list on the playbar, you can also do the same by right-clicking on the playbar. To create channel groups for a particular node, you can click on the node in the Network View and choose Create Nested Channel Groups. The animation editor can have a sub-pane containing a channel list . If you already have a channel list pane open, drag the divider divider left to hide the animation editor’s channel list sub-pane. Switches the pane to graph view. Switches the pane to table view. Switches the pane to dopesheet view. Lets you choose whether you want to view all channels on one graph, or each channel separately on an individual graph. This menu is enabled when you choose Graph Per Channel in the channel drop down menu. It allows you to choose how many graphs you wish to view in the pane. 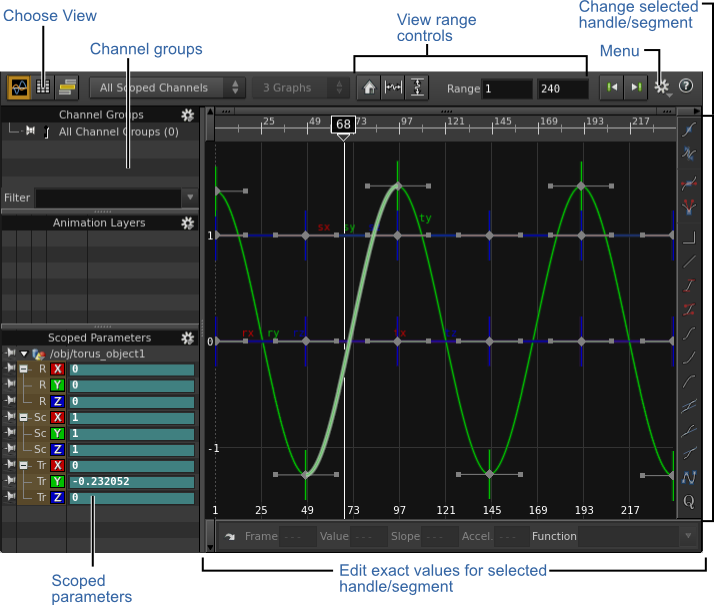 Homes all channels by panning and zooming the graph to show all keys in the current graph or all graphs. Pans and zooms the graph to keep all horizontal values visible. Pans and zooms the graph to keep all vertical values visible. Displays the start and end frames of the sequence. Jumps to the previous keyframe. Jumps to the next keyframe. All of the channels in Houdini are default bezier. The buttons on the function toolbar do not change the type of curve. For example, in earlier versions clicking the line button would set the mathematical equation for the channel to become linear. Now when you click the line button the curve will remain bezier and the handles will line up. You can still change the type of curve by selecting a different one from Function pop-up menu. The timeline slider below the graph controls the range of frames displayed in the graph. Drag the left edge to change the first frame shown in the graph. Drag the right edge to change the last frame shown. Drag the middle to move the range along the timeline. You can also type exact start and end frame numbers in the text boxes on either side of the slider. For more information see playbar help.